Stood in the kitchen, a few weeks ago, I saw a movement outside the kitchen window. Mr.Cobs was out there and up to something. Hmmm. [thinks to self:] I thought I just saw him . . . or did I? Was that a . . . ? Did I see him just . . .? “Nooooooo!” I said (wide-eyed). “Oh, please don’t throw it away. Can you get it back out again?”. “Well yes, course I can, but why? What the heck do you want it for?”. “Well, … I don’t actually know right at this moment …. but I will know. At some point. There’s something inside my brain cell which is trying to send me a message. I know I can use that broken broom pole. Please save it for me? In the shed perhaps? Can you? Pleeeease? ?“ (I said in my sweetest voice). So, bless his beautiful heart, he went and rescued the broken broom pole (for folks outside the UK – we here in the United Kingdom tend to refer to the handle of a broom as a broom pole), and put it in his shed. Last week I finally received the message from HQ (aka: my one remaining brain cell), and the message was …. Make Bird Houses! I showed Mr.C a drawing and gave him a rough measurement, with the instructions: “They don’t have to be perfect, in fact not perfect would be perfect – but can you just cut 3 bits off the broom pole to *this* size, and once they’re cut, if you can give them to me I’ll draw where I want them cut again so that it will make the slope for the roof. Thank Yooooou!” [said in a singy songy way with a sweet, smiling face]. And, God bless his wonderful heart, he cut the wood bits for me, gave them to me and . . . I could tell by the look on his face that he thought (not for the first time) that I was bonkers. However … he now loves what I did with those three bits of chopped up broom pole. Broom Pole Bird Houses. Showing you the wood stained miniature bird house, with the Red Hot Pokers growing at the base. This bird house measures just 8.8cm – or 3.5inches. It’s just stopped raining – and you can see the puddles of rain on the stepping-stones at the base, and rain drops on the roof of the bird house. Each bird house stands on a ‘slice’ of dried wood, which I then decorated to give it that ‘garden’ feel. Broom Pole Bird Houses. A side view of the little Blue stained Bird House. This Bird House stands 9.8cm tall (or 3.85″ inches). It has Ivy growing up around the pole which the Bird House stands on, and the Ivy then winds its way around the black tiled roof. Each slice of wood, which the bird houses stand on, is of a slightly different size, so that there was nothing matching about any of them, other than they were tiny bird houses, a little wonky perhaps, but all of them were stood in a charmed, magical garden, … somewhere. Broom Pole Bird Houses. A slightly angled view of all three bird houses so that you can see some of the details of the ‘ground’ on which they stand. As I look at each of the bird houses I try to decide which one is my favourite, and I’m finding it quite difficult. Mr.Cobs, however, says his favourite is the wood stained one, with the Red Hot Pokers growing around the base. Right at this moment, I think my favourite is the Copper Roofed bird house – simply because I love that copper roof. Broom Pole Bird Houses. The Copper Roof Bird House – stands 12.2cm tall. (which is just 4.80″inches). This bird house stands right at the edge of a small pond in which three golden coloured fish swim happily. The Copper Roof Bird House has its own Box Tree in the shape of a ball, stood in a teeny tiny (but real) terracotta pot. There’s a waterfall – which aerates the water for the fish, and a rock sited within the pond which is for any passing frog to sit on and spend a little time there. The pond is surrounded by slate stones. I REALLY enjoyed making these delight filled little Bird Houses. They were so much fun and yet again …. they’re in my favourite size to work with … LITTLE! Hope you like them too! So … that’s the crafty bit over and done with so now it’s time for coffee . . . Surely every car is a people carrier? What’s the difference between a hippo and a Zippo? One is really heavy, the other is a little lighter. When Clowns divorce – is there a custardy battle? I usually meet my daughter at 12:59, because I like that one-to-one time. I have a friend whose name is Fin. Which means it’s very hard for her to end emails without sounding pretentious. Well that’s me done and dusted. But what about you? What have you been getting up to this week? Had a birthday? Planning a trip? Started Christmas shopping? Crafted something? Feeling poorly? Cooked something new and exciting? Or … has someone been really lovely and/or displayed some kind of kindness towards you? Do share with me, and tell me what’s going on in your corner of the world. In the meantime … I send you my love and very best wishes. I hope that life is treating you kindly, and that you know that everyone here cares about you very much. Previous Birthday Greetings … of the Hare(y) kind! Next Eloquent Acorns! They speak to you! I’m tickled that you like them Heather, and I can understand you liking them so much. I have them sat here next to me as I type, and each time I glance at them they make me smile. Bless your heart for coming. Tell Dizzy not to worry about the crumbs – Mabel likes biscuits of any description, and she’ll vacuum the crumbs up willingly! lol. I’ve just been over to your blog, catching up, and LOVE the new logo. Such a kindness from Elaine. How amazing is that! Hope everything in your corner is fine and groovy. Mr. Cobs is on the mend. But I still hold my breath when he comes anywhere near me so that I don’t breathe in any germs. LOL. I love the little birdhouses. Thank you for not asking us to vote for a favorite. I wouldn’t have been able to decide. Hello Anne. Thank you so much for coming. I’m thrilled you like the bird houses. And … I know how difficult it can be to choose a favourite, so fully understand your comments. Thank you so much for coming Anne. I love to see you. I enjoy your creativity so much. I enjoy you, too!!! Mustn’t forget that!! These are so interesting, I love the them! Bet your husband didn’t see this coming when he rescued the broom pole! Your creativity, talent & attention to detail never fail to amaze me, Cobs. Beautiful! And thanks for the giggles, I love that hippo & zippo one!! Hello I.M. 😀 It’s so lovely to see you. I’m thrilled to bits that you like the little Bird Houses, and no, Mr.Cobs really didn’t guess that this would be what came from an old, broken bit of broom pole. I’m just all giggly inside that you enjoyed the jokes. It’s kind of nice to come across a few smiles now and then, as a surprise ending to a post, and I love making people smile. Thank you so much for coming. It means the world to me to see you here. Oh Cob…You have been up to delightful creations again. Bless you. These are just perfect (of course).Mr. Cob should have known ,if he really thought abot it, not to discard anything that has possibilities .I wish you could come and go through my scrap and come up with such wonders. We would have a good ole grand time digging and thumbing in the scary roon and the craft closet.You would not believe what is there. And some is labeled and in boxes so easy to find….well sort of. Crazy time here. I have a bunch,well several any way,of new cards to go to the new store( Union Mercantile) but things keep getting in the way . Maybe next week. Some of the things is the weather. You know I don’t drive in the rain. I do have wipers but there is a water leak some where and I hate to drag out the wet/dry vac to remove unwanted mosture from the front seat area Yes I’ve had it to the shop twice but no luck.I’m just crazy like that. the other is my problems down the road. Goodness they require a lot of attention and some of it isn’t pleasure. Such is life. Hello my beautiful hearted friend. I’ve been thinking about you all week. I trust you are as well as possible and I’m thrilled to hear that you’ve been crafting and have a bundle of cards to take to Union Mercantile. The rain and the car… I’d phone that garage (shop) and tell them that you’ve taken the darn thing to them twice now, paid for it and they STILL haven’t fixed the problem. Tell them that they need to fix that problem because you’ve now paid for fresh air – TWICE – and you want the problem fixed properly without any further charges to you. (This is something I wouldn’t put up with Beverly. Coo, they’d not try to pull a stunt like this on me! grrrr!). The roads … well when you live out of the main city areas, they don’t tend to care too much about the roads. Could you phone those who are in control of the state of the roads in your area, and give them details of which roads need to be sorted out QUICKLY, because otherwise there’s going to be some sort of accident which they will be held responsible for and possibly sued for not keeping the roads in a decent state. Thinking about it … maybe an email to the right department would work better – for they HAVE to reply and you will have a record of exactly what’s been said. Chicken … I know about and have been praying daily for her. She’s been very much on my mind and I am so relieved to see a blog post from her, which I replied to yesterday, and she’s responded (joy!). She’s really being tested, and I’m thrilled to see that she’s improving, little bit by little bit. Her husband is being wonderful. Bless his heart. Beverly, I would LOVE to go through your crafty hiding places, and come up with ideas for us to make magical things. We’d have a ball of a time – although we’d likely be giggling far too much to make many things. LOL. Tickled pink you like the little Bird Houses. Mr. Cobs thought I’d finally gone crazy when I begged for the old broken broom pole to be saved. But … I knew I could make something from it … and I know I can make more things too. I just have to find the time to squeeze some extra projects in. Thank you for coming for a visit Bev. I love you and love chatting with you too. You are so clever, I love those bird houses 🏡 you certainly have a vision for creating the unexpected. Ah … the coffee in the photograph – wasn’t my coffee. I found the photo on the internet and it both fascinated me and bemused me. Who the heck could make their way through that mountain to get to the coffee, and would the coffee be warm when you eventually got there …. AND … would one still be alive after all that sugar in such a short time? Diabetic coma in a Cup, me thinks. eeeek! Thrilled to pieces that you like the Bird Houses RoseElaine. Thank you so much for coming and for the lovely comment. Wishing you a truly blessed rest of your day! Aww it’s truly great to see you, my lovely blogging friend. I’m tickled all the way down to my toes that you like the Bird Houses, and, like you said – every time I look at them they make me smile right he way through to the core of me. I kept them on my desk for a whole week, because I couldn’t seem to bare to part with them, but they’ve now taken up residence in the living room, and I’ve places them where I can see them. I just love them. Giggling about your comments on the little fairy, laying tummy down along her wand. She’s a real cutie pie, isn’t she! lol. So, so happy to have given you a smile or two with the jokes. Feel free to share them among your friends. I’m sure they’ll love you for them. Smiles are like gifts from the stars, and so good when shared. Thank you for your thoughts and prayers Ruthie. I love you for them. Bless your beautiful heart. Ohhh how lovely it is to see you Kim and bless your heart for your kind comments. Not sure about being the next Leonardo de Vinci of the crafting world mind. More a Mr. Tumble of the craft world, me thinks. lol. Thrilled you like the Broom Pole Bird Houses, and tickled that I made you smile with the joke selection. Ah, Cobbsie, is there anything you cannot make? These are beautiful and I can’t pick a favourite because they are all unique. We’re off to the local theatre on Saturday to have a good ole laugh. “Is there anything you cannot make?” TONS of stuff Sharon, but …. I try. Or should that be ‘trying’?. LOL. So happy that you like the Broom Pole Bird Houses. Bless your heart. Have a wonderful time at the Theatre on Saturday. They’re great places to have family fun and bring a ‘togetherness’ feeling of warmth and love. May your outing be a total hit! Thanks for coming Sharon. Hope you’re keeping well! But you didn’t! Well done, you clever, brave girl! 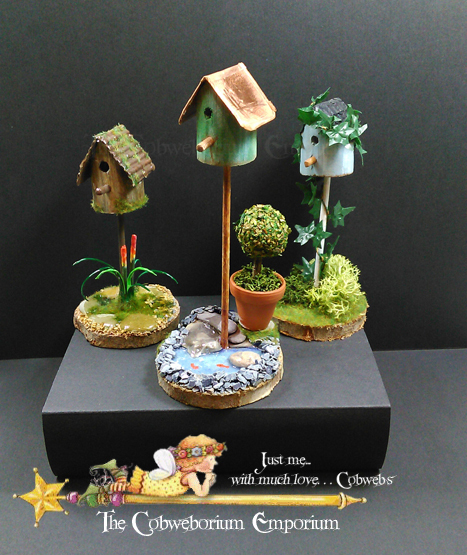 Well Cobs, these little bird houses are so darn cute. Great idea you had and I’m sure Mr. really did think you had lost your mind. I love them all but I am liking the one Mr. likes also, just a smidge more. My week started at the hospital, nothing serious, thank goodness. All is well there, but another gal that was there didn’t get the news she wanted to hear. So another person that I know and care about now has been diagnosed with cancer!!! This disease is just so out of control and there are so many people out there that are fighting the fight and trying new ways to “fix” themselves. “The Truth About Cancer” was a docuseries that I watched on line and my jaw hit the table more than once. Like wars, cancers are a money maker for the Big Pharma companies, so they don’t really want there to be cures for disease as they would lose billions. Sad really isn’t it. Don’t want to be Debbie Downer, so I will stop there, but truly, I have discovered so many wonderful, interesting and truly good people from having cancer myself back in 2010. I am not making little bird houses but I am making socks! I do enjoy making socks, nothing fancy, not fancy at all, just socks using nice yarn. So therapeutic for me. My hands have been stiff from arthritis but we have had some lovely warm days and this is helping a lot. Today and tomorrow are supposed to be the warmest, so the dogs are getting bathed, they are scratching and chewing a lot, so I know its time. Fleas are horrid creatures that serve non purpose, only to annoy our fur babies. My neck has been giving me issues, but I just have to stay off the computer for awhile and eat chocolate and that seems to help. ha ha. Things are going alright tho’, I woke up this morning and said “yay, another lovely day”. I am on the right side of the grass! I can still get about and most of all, I am alive to enjoy yet another day. Can’t wait to see what you make out of something that you find. Truly lovely wee bird houses! I’m sorry to the heart of me to hear about your friend being diagnosed with Cancer. I hope that once she’s got to that place where she finds her fighting strength return, that she adopts a positive mental attitude and goes on to fight this disease and, fingers crossed, win. I shall add a prayer for her to my prayers. May she get the help she needs. Cold weather affecting your arthritis … yes, it has a tendency to do that. Your poor dogs having fleas … I don’t have time for fleas, I have a reminder sent to me from my vets when it’s time to do the flea treatment on my fur family. I have to do my cats every four weeks – but Maisie has to be done every three and a half weeks, for some reason her treatment doesn’t last the four weeks. I found that out from when she was about a year old, so I have to do her every three and a half weeks. The dog has just started on a new flea treatment from the one she was on before. The vet recommended it for her, as it’s a combined thing and treats other things too, which are meant to keep her healthy. She’s got a cough at the moment and if it’s not gone or on the mend within the next day or two, I’m afraid she’s off to the vets (which she really doesn’t like – it makes her shake, bless her). Your neck … perhaps you need a heat pad. One which plugs into the electric. It might help with other problems you’re suffering with too. You can pick them up fairly cheaply -so perhaps you could try one of those and … fingers crossed, it might just give you some relief. Sending my very best wishes to you, and praying for you and your friend. Thank you Cobs. Yes I do have a heating pad, don’t know what I would do without it sometimes. Wish I had a jetted tub!! That would be great! Gave the puppers a bath and there were no sign of fleas. These guys are allergic to bites I guess and once bitten they itch and chew. It usually will clear up with a week of the bath. The colder weather is coming too so that will help a lot. I use natural things like lavender, tea tree, citrus spray. They help a lot too. I have washed all their beds and my blankets on the bed, and tomorrow is vacuuming where the sun doesn’t shine lol, around the edges of things and places. That will take care of flea stuff too. The day was beautiful and tomorrow is supposed to be another, so I am going to enjoy it cause soon, rain rain rain rain rain. Aw well, could be worse. Wishing a bright, warm day and hours of happy to accompany it, Soozy. The rain is heading our way too, the weatherman tells us. But I don’t care. Let’s put on a happy face and not let it trouble us, eh? We can turn up the heating and let the rain water the land. We’ll stay happy and warm inside. Ooooh Gilly . . . that’s a thing which causes me some headaches. Some things are donated to charity. Some things, like handmade cards, are made with someone particular in mind. Other things I love too much and can’t bear to part with them. But … Mr.Cobs has got a bit put out about me not parting with enough things … and he’s set up an account on Ebay for me to sell some things there. Now he set up that account several weeks ago and so far …. well, lets just say I’m a big failure. lol. I haven’t even put one thing up for sale yet! But … I’ve promised I will, and I will. It just feels like parting with a child! Oooooo! tsk tsk. Aw, thank you so much for coming GillyF. and for staying long enough to chat over a coffee. Great talking with you. As always your creativity amazes me that you can make such delightfully small creations. I love the copper topped house also. There’s so much detail and so much happening (or could happen). I do hope you are keeping well and that Mr Cobs is also on the mend and hasn’t passed his nasty virus on to you. Flat out like a lizard drinking here. Don’t know where the time is going and I feel like I’m not getting a great deal done … but having said that we had a great ukelele morning today with some of our uke classmates at the home of a “newcomer” … a very accomplished musician who is kindly sharing his skills with us. We stretched fingers and brain cells and stepped out of our comfort zones for a a fun filled two hours. It’s amazing how music takes me to another place and all my aches and pains seem to vanish. My crochet is suffering from neglect and I must gather up my enthusiasm and get back to it. I seem to have stalled but I’m sure inspiration is just around the corner. My yarn stash has all been catalogued and colour sorted and now that I know what I have I can (maybe read that as “should”) start making plans. Love reading your stories and seeing your creations. Hello Kay 🙂 great to see you! I too have those days where I don’t know where the time has gone. But then…. I have a huge issue with T.I.M.E.. There’s something about time which has bugged me for years. So many years that I can’t even remember when I didn’t have this ‘thing’ about Time. GREAT to hear about you and your husband taking music lessons on the Ukulele together. What a great hobby to take up. Something wonderful to pass the time, and have a fabulous get together with like minded friends. Brilliant! Hope you get your crochet mojo back again soon. Christmas is coming, and I’m sure that there are people on your list who are hoping for a little something in the crochet variety! Thank you so much for coming Kay, and for the fabulous message. I’m tickled from my toes to the top of my head that you like the Broom Pole Bird Houses. Bless your heart. Do you have any special sayings in your family? After some lovely sunshiny Spring weather we have a grey, wet day with the chance of a storm. Yesterday we had ferocious north west winds that brought down quite a few branches off our big Marri trees at the front of the house. At this time of the year we tense up when we get big winds as we’re coming into fire season and although we technically live in a suburban town, we are situated in the Darling Ranges, about 30 kilometres from the city of Perth and we’re surrounded by very volatile native vegetation which fire bugs love setting alight to. We’ve had a very wet winter, which always means a volatile summer as there is so much tinder for a fire to take hold on. When we moved here 40 years ago we very rarely had people lighting fires, but now it’s like summer is “open season” for the crazies. So much vegetation and wildlife get lost each year because of them. We’ve been fortunate, but every year we have our evacuation bags packed at the beginning of Spring “just in case”. It’s a fact of life these days. Today is a singing morning with my Secret Women’s Business group. We’re rehearsing for two performances at a SongFest in the south west town of Dunsborough at the end of October, so I must get myself moving and on my way as it’s an hour’s drive to rehearsal. Sending you much love and wishing you a sunshiny day. LOVE your dads saying about blowing the wax out of your ears. LOL! That tickled me so much that I read it out to Mr.Cobs while I was still giggling. lol. I told them that if someone was calling them names or even saying bad words to them, they shouldn’t try to get one over the name caller by calling names back. But instead they should stand firmly on both feet and raise their voice only a little, but firmly say AT them …. “MILK BOTTLES” and walk away. I felt my heart heave a sad sigh when I read about you having to live with evacuation bags from the beginning of spring. But, it’s better to be safe and ready, and give yourselves the best chances, rather than trust to luck. I’m kinda glad that you do it for it means that you’re taking care of everything, just in case, and that can only be a good thing. I hope you thoroughly enjoyed your singing morning. How fabulous. I cannot think of anything better than getting together with like minded people and singing your heart out. I find that singing lifts my spirits, so I’m guessing that it does the same for you, but amplified because you have a whole bundle of people joining together as one, and raising the roof! Wonderful! Have a blessed weekend Kay. May the weather treat you kindly and may contentment fill your heart and home. LOL … his face said everything he was thinking, Hannah, totally. lol. Thanks for coming Hannah, and for the fabulous message. Tickled from my head to my toes that you like the little Broom Pole Bird Houses. Thank you so much for you lovely comment. Bless your beautiful heart. I had a feeling that you and birdhouses would make a good team. I can imagine Spring wreathes with bird houses in them. They’re such friendly looking things and they ‘speak’ to a lot of people. Aw thanks for coming Tam. I was imagining them in Wreaths!!! How did you know!!!! =) .. I was also imagining them a pretty Moss pot garden =) They are lovely ❤ xoxoxoxox my friend. Thank you for sharing them! We obviously have a crafting connections going on Tam, for I also thought of putting these into larger terracotta pots, with moss and ‘pretties’. Haha, Cobs I was laughing before I even got to the funnies. That cup of coffee did it for me. And the bird houses are simply magical. Sprinkled with the unique magic of your wonderful self. So so pretty. They just make me happy. At present I am doing an online water colouring course from ‘Art tutor,’ which is keeping me occupied. It’s something I would like to improve (I can’t just keep collecting water colours and admiring how they look in their little container. Isn’t it good to be crafty? As always, it’s wonderful to see you. Your online water colouring course sounds brilliant, and I have been heard to say over the past few weeks that I have to improve my water colouring skills and confidence, as I would like to be happier about allowing the ‘paints’ to just flow instead of trying to control where they are. I need to loosen up and just ….. [sings]… Let it flow, let it flow, can’t hold it back anymore.. . . . .” LOL. (song from Frozen). Sending you crafty paint vibes and looking forward to seeing some blog posts about your journey as you water-colour your way through your course! Cute, cute, cute birdhouses! You are a master crafter! OMG, that coffee. I don’t know whether to say LOVE or to run from the pile of sugar on top! It’s a super pretty cup, so I think you could open a crafter’s coffee house one day. TICKLED from my head to my toes that you like the Birdhouses! I love them too. The coffee … well, I didn’t make that, it was a photo I found on the net. BUT … if every I did open a Crafters Coffee House, I solemnly swear that I would serve coffee EXACTLY LIKE THAT ONE! (along with a spoon). Glad you got a giggle from the jokes. I love jokes and figure that we could all do with sharing the smiles around, so add them when I have some new (to me) ones. Thank Heavens above that you changed your mind and didn’t go to Panama City! Phew … see … good things happen to you even when you don’t notice! You’re alive, in one piece and home safe, and for those blessings I’m truly thankful. I know you’ve had some sort of odd and painful fairground ride this year. It’s been full of ups and downs. But … don’t wait for 2019 to begin looking up Nancee. Start right now. There is a very old Great British saying which, I think (but not sure) dates from either the Edwardian times or early Victorian times, and its: “Keep looking at the Chimney Pots!” – and it was said to people who were fed up, miserable, depressed, a bit down in the dumps, or just going through a trying time. Doctors used to tell these people that in order to feel better they should keep looking up at the Chimney Pots. Now it sounded weird but those who did it actually showed an improvement of their mood. After learning about this, I looked into why it had such a result, and apparently those doctors weren’t as daft as they may have sounded. By being told to look to the chimney pots, what their patients were doing was keeping their eye-line ‘up’, which meant that they had to tilt their heads back a little way to see the chimney pots. This position of the head (chin kept level with the floor – so head tilted a little) released various endorphins into the body’s system, which improved mood and outlook. So … from this point, I want you to keep looking at the chimney pots. OR … if there are none to look at, keep your chin and jaw bone, level with the ground. Let’s get you positive and happy again Nancee. You’ve experienced many things this year and they’ve left you feeling not quite yourself. From this moment on, we’re going to find Nancee again and get you fine and groovy again! Oh … and crafting. Tickled you like the Broom Pole Bird Houses, and that, like me, you loved the sight of that coffee. I only wish it were real. LOL. Sending great vibes your way. Remember … Chin up Nancee. Chin UP! Aww, thank you Daisies. I’m thrilled that you like them. Lovely to have you back in blog land. I miss you when you aren’t around. How wonderful that you got to see Evita. Must have been such an incredible experience. So happy to have you home again.